Along with the method names and descriptions, the exceptions that it may throw are also listed. The catch blocks provide a means to handle these Exceptions. A try block may be followed by any number of catch blocks. 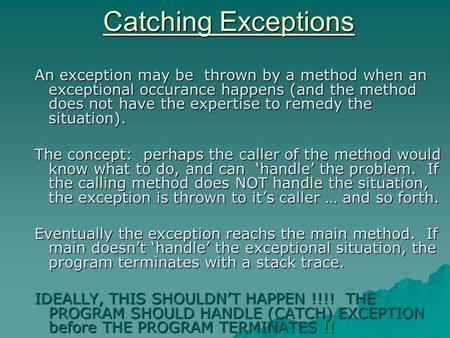 Each catch blocks handles a particular type of Exception. As we have already said, an Exception is an object. The corresponding catch block receives the Exception thrown by the try... As mentioned in the previous chapter, exceptions are the customary way in Java to indicate to a calling method that an abnormal condition occurred. The execute() method parses two numbers x and y from the request and produces sum of both. In this case, an exception might be thrown if either x or y is not a number (a java.lang.NumberFormatException exception is raised).... Hi; I have an application that in one method calls two other methods respectively, and both methods may throw IOException and i like to catch them in caller method, but i don't know if there is something in Exceptions to tell about where it was thrown in the application. Hi; I have an application that in one method calls two other methods respectively, and both methods may throw IOException and i like to catch them in caller method, but i don't know if there is something in Exceptions to tell about where it was thrown in the application. You can define your own exception class extending java.lang.Exception (that's for checked exception - these which must be caught), or extending java.lang.RuntimeException - these exceptions does not have to be caught. It is generally desirable to document the unchecked exceptions that a method can throw: this allows (but does not require) the caller to handle these exceptions. For example, it allows the caller to "translate" an implementation-dependent unchecked exception to some other exception that is more appropriate to the caller's exported abstraction.